This week is my 400th post…Wednesday to be exact. I will announce a little contest on Wednesday that will run till the end of the week. Keep your eyes open! This week I want to finish the last central quadrant of Lost Soul and start on the border. Time to get this baby DONE! I also want to spend time on Deanne’s Beginning to Hook Abstracts course. Right now I am busy sketching. Having a blast! 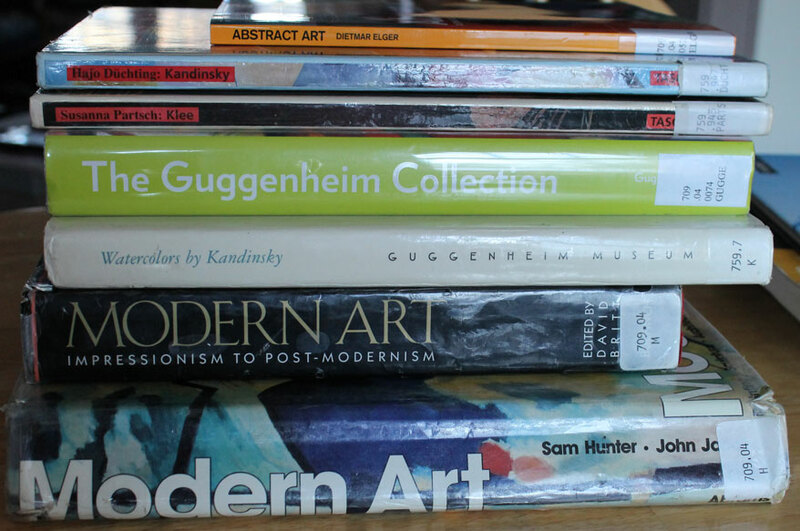 Yesterday I checked out our main library branch in town and found oodles of books on modern art, a few on abstract itself, and a few on particular artists that interest me. I also picked up some books on photography. Still need to sew up some sleeves for small 6″ rugettes. Might be a good idea to put some of them on backing as well. We will see. I have a lot on the go already. It would be nice to spin more on the soy silk/alpaca blend singles. Might not have time for plying, but spinning the singles maybe. One of my ESL students will be taking a hiatus to partake of more formal learning, leaving me with two whole days a week to devote to rug hooking endeavours, plus afternoons the other three days. Plus hubby works all week, meaning fewer distractions. I have two prayer meetings and a Ladies Fellowship meeting to attend at church. All that should make for a fairly busy week for me. I am off to a great start today. 🙂 Hope everyone has a great day!